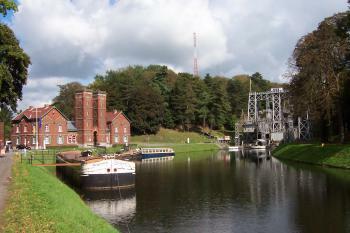 Together with the Canal itself and its associated structures, they constitute a remarkably well preserved and complete example of a late 19th century industrial landscape. 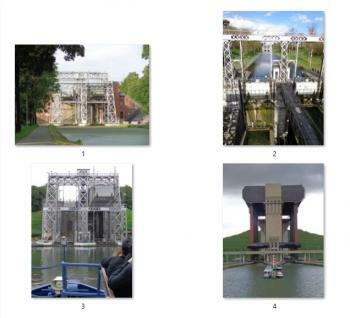 The lifts were necessary because of the differences in height of the Canal. There is a rise of some 90 metres from Mons to the summit level of 121 metres above sea level. Most of this rise is concentrated in a few kilometres - hence the artificial help. The first of the lifts was built here in 1888 by the John Cockerill company, after an English design. 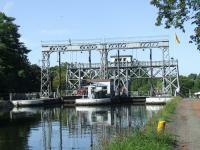 Of the eight hydraulic boat lifts built at the end of the last and the beginning of this century, the only ones which still exist in their original working condition are the four lifts on the Canal du Centre. 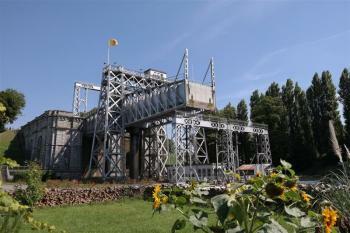 There now is even a modern fifth one at Strépy-Thieu. 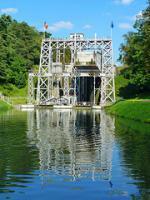 The Four Lifts can be found in the Canal du Centre between La Louvière and Mons. The road to the lifts (ascenseurs in French) is well-signposted from the E19 highway coming from Brussels. First I visited Lift no. 3. That one is situated in a small town that has seen better days. I was amazed to see the old buildings that surround the lift: it looked as if I had arrived in Northern England! The Industrial Revolution has left a large mark on Wallonia, and certainly in this region. A few kilometers away you can take a look at Lift no. 1. You can walk around this one and take a closer look. Unfortunately there were no ships in the canal, so I haven't seen the huge construction in action. My wife and I visited the canal lifts in August 2017, and used a rental car to drive between the four location from our base in the town of Mons (also contains a belfry if you're collecting those!). Driving is by far the easiest way to see the four lifts, though cycling would also be possible as a well-kept cycle path tracks alongside the (now rarely used) canal. I actually quite enjoyed this sight, particularly once the concept of balance lifts had been explained! Sadly they weren't operating on the day of our visit, so we had to use our imagination. It's also worth stopping off at Strepy-Theiu, where an enormous lift from the 1980s replaced the four WH-listed lifts. It's crazy to see how far technology has come in a century! 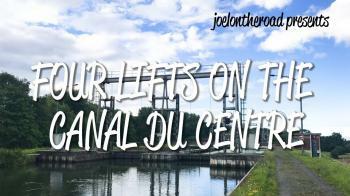 The four lifts are located along a seven kilometre stretch of the Canal du Centre and it’s easy to walk along to see them by yourself. The path that runs along the bank on one side is popular with joggers, cyclists and dog walkers. It makes you realise that these lifts – although not in a city – are close enough to houses to be part of recreation areas. Even today they cut a striking figure on the canal. The lifts are huge and you can see them for a long time as you approach, like enormous metal spiders hovering over the water. There’s a beauty to their industrial design and, although they clash with the natural surroundings, they also look like they are where they belong. I first visited this site back in April without much prep, and, when I did so, learned about some boat tours through the canal. I'm not sure why I have been so fascinated by canals lately, but I had to come back here for the tours. I could not get the accurate info on which tours will take me where because their website is still full of old info, but now that I actually took some of the tours, I have the accurate, current info. There is only one boat tour for the old lifts, which departs from the new lift at Thieu in the morning and goes through the old Life 4 only. The boat tour ends at the machine room by Lift 3, and a bus takes you back to the new lift. In the afternoon tour, although you meet at the new lift, a bus will first take you to the machine room by Lift 3, and the boat tour starts from there bringing you and the boat back to the new lift. But this tour is highly recommended. It went through a lock, a lift (Lift 4), two vertically moving bridges, and one horizontally rotating bridge and ended inside the machine room. The tour guide was exceptionally brilliant and nice. I was the only English speaker, but he personally explained everything to me after he did so in French and Dutch. I had visited Lift 3 and 2 in April, and this time I even made an effort to visit Lift 1 and the Italian canteen, part of the WHS, where I had dinner. My only regret is that the museum for the Italian canal workers by the canteen was closed in the evening. Contrary to what I had heard, all the four lifts are still at work today, but only for recreational purpose and not for commercial purpose. If you have your own boat or hire a boat, you can go through all the four lifts for free! The Belgium government decided to make it free in order to promote the water recreation, I was told. The second tour I took was that of the new lift. 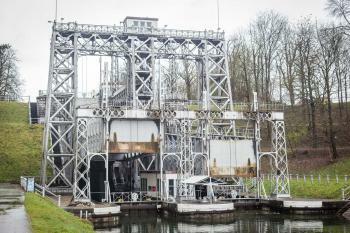 Although the new lift is not part of the WHS, this boat tour in which your boat goes up or down at this world's tallest boat lift is also recommended. I can't wait to visit Suez and / or Panama canals! Unfortunately we did not see the lifts in action and in such a case it is not a WHS with a big wow-factor. However, it's a nice walk along the old canal du centre - walking from lift 1 to 3 is about 3 km - and every lift itself is an impressive piece of machinery. There are three other WHS nearby (Mining sites of Wallonia - Bois du Luc, Neolithic flint mines at Spiennes and the Mons belfry) and all of them are free of charge every first Sunday of the month. Taking this into account, the La Louvière/Mons region is worth a visit. This WHS was a great interesting surprise compared to the other Belgian WHS. When I visited in August 2012 on a hot sunny day I experienced 2 of the 4 lifts first-hand with the boat trip from the Italian Canteen. I was the only "tourist" to be seen, the rest where locals. Then I walked along the canal trail to see all the lifts and went by car to visit the huge new funicular lift of Strépy-Thieu. This was a great afternoon and a "hidden" WHS in Belgium. I spent some time on a fine summers day watching vessels pass along the canal and being raised or lowered through lifts 2 and 3, and certainly the procedure was ingenious. This was after following the tow path beside the canal from Braoquegnies Bridge, a few steps from Braoquegnies station (trains and buses to Mons). This was a pleasant place to walk around on a nice autumn day. Unfortunately Lift No1 was being heavily restored (by Eiffel) whilst I visited. This was the result of accident involving a barge, the battered remains of which were sitting in front of the lift in a particularly algae ridden part of the canal. The structure did look very impressive though. We then carried on down to Lifts 2 and 3, which provided a nice stroll and enabled a closer look at the structures. These were not as large as Lift 1 but I still liked their appearance. I do have a soft spot for Iron architecture. Also at this site is a pump room and a café; so this was a nice place to visit. My Belgian friends all laughed when I said I was going to visit La Louviére. It has a reputation for being the ugliest city in the country, and what I saw of it did not prove them wrong. The ‘ascenseurs hydrauliques’ are well signposted from the main road/ motorway. Nearby is the new massive €675 million lift at Strépy-Thieu showing that the heritage is still being used to great effect today. Apparently la Cantine des Italiens near Lift 1 offers trips along the canal through the lifts, I think would be a very nice way to see them in action. Overall this was a nice place to stop as we were passing through and had an hour to spare but it certainly isn’t a highlight of the world heritage list. Collecting World Heritage Sites sometimes takes you to places you never would have intended to go to. But by still doing so you can be sure that there is always a fascinating story to be told. 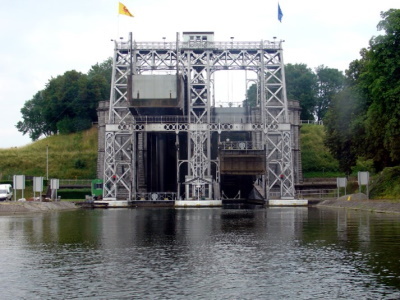 So during a trip in June 2004 to Belgium and the Wallonian area I decided to visit the “Hydraulic boat lifts of La Louviére and Le Roeulx in the district of Hainault”, one of the still quite few industrial historical sites listed on the World Heritage List and my personal 137th site. One might wonder what a boat lift is but it’s really not more complicated than it sounds. The principle is simple: two bathtubs wherein you place one barge each and then you fill one of them with slightly more water than the other and the first bathtub will push the second one upwards through hydraulic power. The real question is WHY and the story goes that in this once prosperous area of coal mining, transportation – before the train - was only possible on water and the canal du Centre was build - A proud national canal that was making its way through a landscape with rolling hills not entirely suited for canals. And the only way to overcome the landscapes difficulties then was of course to build - boat lifts!